Ph 03 5759 2525 for bookings & all enquiries. 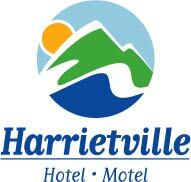 The Harrietville Hotel Motel is on the Great Alpine Road located on the left hand side as you come into town from Bright; next door to the Harrietville Primary School, before the School Bridge. If you are coming from Omeo, the Harrietville Hotel Motel is located on the right hand side, after you have crossed the School bridge. The nearest airport is Albury Airport a one hour and 30 minute drive to Harrietville. Rental cars are available from the airport.